Schodack Town Hall is located at 235 Schuurman Road, Castleton, NY 12033; phone: 518-477-7918. The town was incorporated in 1795. Photo: Blink Bonnie Home, ca. 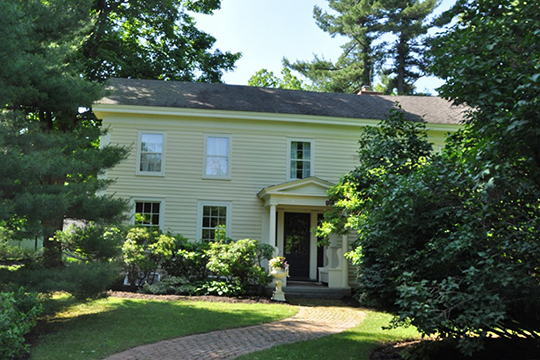 1850, 1368 Sunset Road, Schodack, NY. Listed on the National Register of Historic Places, in 2000. Photographed by User:Magicpiano (own work), 2012, [cc-by-4.0 (creativecommons.org/licenses/by-sa/4.0/deed.en)], via Wikimedia Commons, accessed March, 2018. The Township of Schodack is one of the oldest in the county of Rensselaer, and was the head-center or capital of the Mahican tribe. It had its origin in the word Schoti, signifying fire, and ack, place; or the place of the ever burning council-fire of the Mahican tribe. Here King Aepgin, on the 8th of September 1680, sold to Van Rensselaer "all that tract of country on the west side of the Hudson, extending from Beeren Island up to Smack's Island, and in breadth two days' journey." The Mahican tribe originally occupied all the east bank of the Hudson north of Roeliffe Jansen's Kill, near Germantown, to the head waters of the Hudson; and, on the west bank from Cohoes to Catskill. The town of Schodack was central, and a signal displayed from the hills near Castleton could be seen for thirty miles in every direction. After the Mahicans left the Hudson, they went to Westenhook, or Housatonic, to the hills of Stockbridge, and then, on invitation of the Oneidas, removed to Oneida County in 1785, where they lived until 1821. Then, with other Indians of New York, they purchased a tract of land near Fox River, Minnesota. Wallace Bruce, The Hudson River by Daylight, Gaylord Watson Publisher, New York, 1873.